In 1996, commercial radio underwent a quiet revolution. In the wake of the new “Telecom Act,” local station owners everywhere sold their stations to conglomerate groups as fast as they could. The new corporate owners gutted staffs. 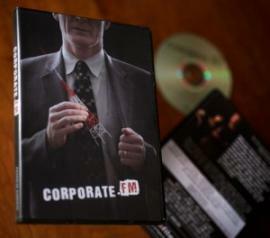 Corporate FM is about what happens when a city loses a communal microphone. Radioʼs broad coverage gives it the ability to unify huge populations. Unlike Facebook, Satellite radio, or webbased music sharing apps, locally owned terrestrial radio can reach thousands of people across all incomes and ages in a local region at the same time with a message that is relevant to them at that moment. Unfortunately, as private equity firms bought out stations by the hundreds—only to stick the stations with the debt incurred—they also stripped everything that was human, local, or civicminded from stations in an efforts to chisel down to that bottom line. The model of a curatorial DJ informing listeners of new bands, especially local ones, was tossed for cookie-cutter stations with vast swathes of voice-tracked programming. Worse, the death of privately operated local radio stations is not just destroying the stations that are bought up, but damning the future of all stations on the dial—the public and college stations as well. The entire medium of radio becomes threatened when there are only two stations worth listening to. By investigating how the financial system gutted commercial radio instead of growing it, documentary filmmakers Kevin McKinney and Jill McKeever reveal the problem and propose a solution that could revitalize the medium and rejuvenate the communities that radio is legally obliged to serve. Director, Kevin McKinney is an independent filmmaker from Kansas City Missouri. He first became interested in radio as a 12 year-old in the Philippines where he would call in requests to FEN radio (a US military station). McKinney's previous films have investigated disability issues and the archeology of garbage. He was awarded winner or the Aspiring Filmmakers's Award by the Film Society for his previous film Planet Trash.